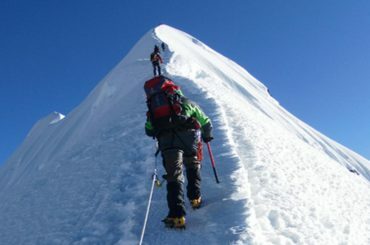 Island Peak climbing is the most popular climbing peak in Nepal. Its was first named Island Peak by a group of mountaineers led by Eric Shipton in 1952. At the time it did not have an official name and the group noticed that it looked like an Island in a sea of ice as you look at it from the nearby village of Dingboche (4410m). 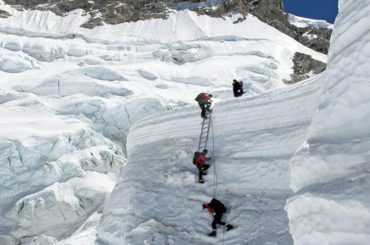 The usual method of climbing Island Peak is to do it on the way back from Everest Base Camp and Kala Pattar to help with acclimatisation. You can rest in the village of Dingboche before taking a half day walk to Chukhung (4900m). In Chukhung we stock up with any food or equipment that we need for the climb, then move on to base camp. From base camp we have the option of either moving on to high camp for another night or pressing on to the summit. This will depend on several factors. How acclimatised everyone feels, and of course, our old friend the weather. 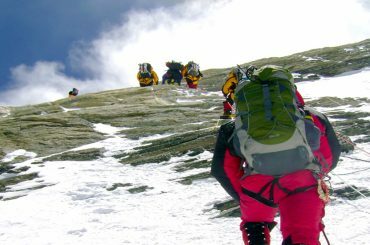 We always make sure that we leave extra days to make sure that we have the highest possible chance to make a safe and successful summit. Day-01:Arrival in Kathmandu (1345 meters). Day-03:Fly to Lukla (2804 m.) Trek to Phakding (2610 m.) 3-4 hours. Day-04:Trek to Namche Bazaar (3440 m.) 6 hours. Day-06:Trek to Tengboche Monastery (3860 m.) 5 hours. Day-07:Trek to Dingboche (4350 m.) 5-6 hours. Day-09:Trek to Lobuche (4910 m) 4-5 hours. Day-10:Trek to Everest Base Camp (5365 m.) and back to Gorak Shep (5180 meters). 8 hours. Day-11:Hike up to Kalapatthar (5555 meters) early in the morning then trek down to Pheriche (4240 meters). 6-7 hours. Day-12:Trek to Chhukung (4730m) 3hrs. Day-13:Trek to Island Peak Base Camp. (5200m) 3-4 hrs. Day-14:Trek to High Camp (5600m.) 3 hrs. Day-15:Island peak Summit (6189m) and back to chhukung. Day-16:Trek back to tangboche (3860m.m) 5-6hrs. Day-17:Trek to Namche Bazaar (3441m.) 4-5 hours. Day-18:Trek to Lukla (2804 m.) 6 – 7hours. Day-19:Morning flight back to Kathmandu. Day-21:Departure, transfer to airport or extend trip.